For our Daring Baker's challenge Cat of Little Miss Cupcake asked us to make a piece montée (aka croquembouche). The classic piece montée is a tall cone shaped tower of pastry cream filled cream puffs that are dipped in chocolate or caramel. The puffs are bound together with caramel to hold the cone shape. 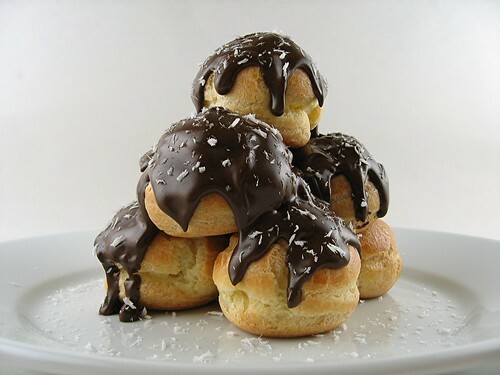 There are 3 components: pate a choux (cream puff dough), pastry cream (to fill the cream puffs), and caramel or chocolate glaze (to "glue" the filled cream puffs into shape). Making pate a choux is something I've done many times. You have to make sure the flour gets cooked until the dough forms a ball and there's a film on the bottom of the pot. Then it's ready for the eggs. I cheated a little and beat in the eggs using my KitchenAid stand mixer instead of by hand. The machine really helps work the dough so that the gluten will develop and hold the structure of the puff. But I've done it by hand in the past and have gotten successful puffs that way too. Using the given recipe and piping 1x1-inch puffs, I got 45 puffs which is way more than the 28 mentioned. I didn’t really want to make a tall tower since it would be hard to transport it. So I made a sad little pile of cream puffs to photograph and keep for me and my husband. Thankfully Cat said we didn't have to make it super tall and that we're only required to make it a “mounted piece” meaning that it has some height. I know mine barely has any height and is a poor excuse for a croquembouche, but two people can only eat so much dessert. I filled all the remaining puffs, glazed them with chocolate and served them as individual cream puffs. Even though Cat provided some recipes for pastry creams, she also gave us the freedom to use any crème patisserie we liked. I decided to make a coconut pastry cream since I was already making some for another baking project. I didn't feel like working with hot molten sugar so I chose to "glue" my puffs with melted chocolate instead of a caramel glaze. To finish them off I gave it a light dusting of finely shredded desiccated coconut just so you know that it's coconut. So there you have it. Another Daring Bakers' challenge completed! 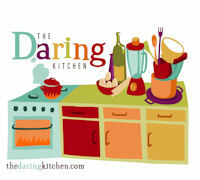 To learn more about the Daring Bakers or to join the bakers, check out The Daring Kitchen. Preparation time: You will want to use your puff pastry batter and chocolate glaze or caramel as soon as it has been prepared and as close to serving time as possible. This is not a dessert that stores well and it may be a bit temperamental in humid areas as the glaze needs to harden to hold the choux together. The pastry cream (crème patisserie) can be made a couple of days in advance and stored in the refrigerator until ready to use. You will need approximately 10 minutes to prepare the cream puff dough, 10 minutes to pipe and about 30 minutes to bake each batch. The pastry cream should take about 10 minutes to cook and then will need to be cooled for at least 2 hours or overnight. The glazes take about 10 minutes to prepare. Combine the whole milk, coconut milk and vanilla bean and seeds in a medium nonreactive saucepan and bring to a simmer over low heat. Whisk together the yolks, sugar and cornstarch in a large bowl. Remove vanilla bean from warm milk. Slowly whisk the warm milk into the egg mixture and then return the mixture to the pot over medium heat and bring to a boil, whisking constantly, until thickened. Scrape the mixture into a clean bowl and whisk in vanilla extract and butter until the butter is melted and incorporated. In order to avoid a skin forming on the custard, cover with plastic wrap pressed directly onto the surface of the custard. Pre-heat oven to 425F/220C degrees. Line two baking sheets with parchment paper. Bake the choux at 425F/220C degrees until well-puffed and turning lightly golden in color, about 10 minutes. Lower the temperature to 350F/180C degrees and continue baking until well-colored and dry, about 20 minutes more. Remove to a rack and cool. Cooled puffs can be stored in an airtight container overnight at room temperature before filling with pastry cream. Use the chocolate glaze or caramel glaze to top your choux and assemble your piece montée. I think your 'pile of puffs' is adorable! Great idea to use coconut pastry cream, I bet that was perfect with the chocolate sauce. Nice! Looks so delish. But, since I can't pronounce those words, I will just admire your work from afar and not even attempt to try and make it! HI Mary! absolutely delicious looking hill. 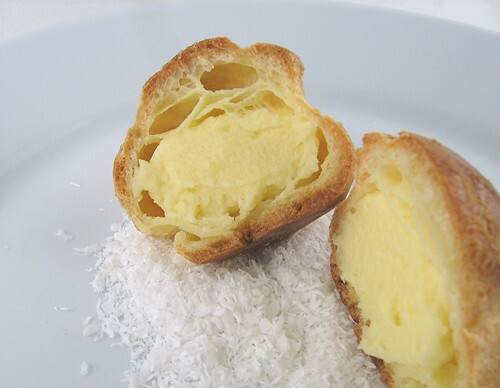 love the picture of the cut puff. I don't think there is anything sad about a pile of cream puffs. to be honest i am thinking of making a pile of puffs too. i have not put mine together yet!! will do later today! but this is looking good to me! Beautiful! It looks so tempting. Great job! Looks really pretty and the coconut pastry cream sounds wonderful with the chocolate. The puffs were a little small, but delicious. Not sure why pate a choux scares me. One of those technique type things I need to learn sooner or later. Yours look lovely. Wow. That is gorgeous. I found you through Pinch My Salt and I'm so glad I did! I'm looking forward to more of your recipes. Mmmm...looks so tempting. I,m just not sure my expertise in the kitchen are good enough to make a successful choux pastry yet. It is one of those things I have been hesitant to try. You have inspired me though! Those are just so beautiful! You pile of puffs are novel & adorable! I agree with Valerie, your mini-montee is very cute! I wonder if you'll be doing this month's challenge? I'm considering it (better get my skates on, hehe) but it seems So intense - 800 ml cream, woah. These cream puffs look delicious! I'm new to your blog, and it looks just great! You've got a new follower! My cream puffs are now in the oven. Somehow, my Choux batter ended being too liquid and I couldn't pipe it. I proceeded to add more and more flower until I saw the consistency of "lightly buttered mashed potatoes"; however, it could've already been too late since the additional flower never went through the process of being heated in the pot prior to receiving the eggs. My filling is cooking in the refrigerator. It's been 1.5 hours, and it's still rather liquid. The pastry cream recipe calls for butter mid way through the prep, but the amount of butter is unspecified in the cream's ingredients' list. I don't know what I did wrong as I followed the recipe very closely and accurately. My puffs are now in the oven and they probably won't rise. I followed the recipe precisely, and my batter was just too liquid. I had to add a whole extra cup of flower to the batter after I've incorporated all the eggs, which makes me doubt that my puffs will turn out. My filling has been cooling in the refrigerator for the past 1.5 hours, and the filling is still looking rather liquified. I don't think it's thickening fast enough. The pastry cream's recipe calls for butter; however, there's not an indication of how much butter it needs in the ingredients list. Alina - Sorry for the late response. I've been away on holiday. Thank you for catching the omission of butter in the ingredients list. I have added it. If the pastry cream is not thickened to the proper consistency while cooking on the stove top it will not get much thicker in the refrigerator.